Christian Picciolini, who used to sing in a white-power skinhead rock band, now shares his story with others so that they don't have to make the same mistakes. Photo by Jon Lowenstein. Music has been the one constant in Christian Picciolini’s life. Twenty years ago, Picciolini was a 17-year-old who used music as a means of venting his aggression. He was the lead singer in a white-power skinhead band, White American Youth, which became the first American skinhead group to perform in Europe–”in Berlin in 1993. Then, 15 years ago, music led him out of the skinhead movement. Picciolini borrowed $3,000 from his parents and opened a punk rock record store in Alsip. With the business in mind, he decided to keep his politics out of the way he ran the store. Picciolini began to talk about music with customers of various races and backgrounds, chatting about a new record or the bands coming through town. “I started to realize they were real people and weren’t so bad,” he says. 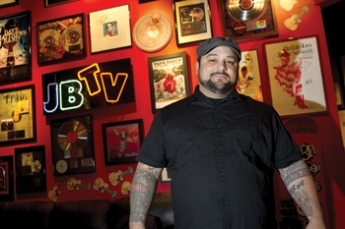 Today, Picciolini is the general manager of JBTV, a local music TV and video production house that broadcasts a show that Picciolini has been watching since his early teens. Picciolini says that his life has come full circle. “I owe mistakes in my life to music, I owe positive aspects of my life to music and hopefully I owe my future to music,” he says. Picciolini sat down with The Chicago Reporter to talk about his transformation. How did you become involved with skinheads? I was born into it by virtue of growing up in Blue Island because Blue Island was a very small, tight-knit community, a very ethnic community. I saw them from a young age at 13 or 14. The way they dressed was cool. I’d never seen anything like it–”never seen a group of people with shaved heads and Doc Marten boots and thin suspenders and listened to punk rock music. Skinheads were new to the United States. What attracted you to the skinhead ideology? They didn’t seem like a gang: They weren’t selling drugs and weren’t hanging out on a corner chasing people away. In my opinion at that time, I thought they were trying to protect the neighborhood, and that they were trying to educate people. When you’re a kid, you’ve got your parents telling you not to do something just because. These people were telling me, –˜Don’t smoke pot because if you smoke pot, it degrades your race, and you’ll start to become friends with people who will take advantage of you, and you’re giving money to people who turn around and use that money against you.’ To me, those were really valid reasons. They were looking out for me, is what I thought. My parents just tell you, –˜You shouldn’t do that because it’s wrong.’ Well, why is it wrong? So they became my parental figures, and I started to trust them more than I trusted anybody else. Why did you believe in it? It was absolutely, 100 percent the power, because I rose quickly to a position of power. Since I had been hanging around them at 13 and 14, by the time I was 16, all these older guys that had taught me everything they knew started to go to jail, started to die or started to move away, and I inherited it. I was just a kid, but I inherited all the power: It was my crew. I was now in charge of the first white-power skinhead crew in the county. Music was powerful. The position of prominence was powerful. The fact that I didn’t have to do anything, and people did it, and all I had to do was say something–”it was intoxicating. How did music play a role in that attraction? It was always something that when I listened to it on the radio, it made me feel different–”it made me feel more powerful. So when I was 16, I started my own band. It made me violent; it made me happy. That was my trigger, and I realized quickly that that was a trigger for other people as well. It’s such a powerful medium to make people feel a certain way or do certain things. What songs were the most influential at each stage in your life? That’s a pretty deep question. Before I was involved–”The Clash has always been my favorite band. The Clash’s –˜Should I Stay or Should I Go’–”the title itself is descriptive, because I had doubts. And getting out? I think all music inspired me getting out. I learned to love music again. When I was involved in the skinhead movement, it was just skinhead music. I cut out everything that was important to me to focus on that, so I just owe music in general as getting me out because it opened me back up to the world. How did you realize you had made a mistake? What I’d hated for so long was not based on truth. I was a young, impressionable kid who was surrounded by people with a lot of influence. It was really just a bunch of alcoholics from broken homes who fought each other most of the time at concerts. That was one of the reasons why I started to realize what I was doing with my life was not the path I should be on. I just became part of it because of my environment. It’s so much easier to hate somebody and blame somebody for what you’re going through than it is to look deep inside yourself and realize what it is that you’re doing that’s making mistakes. Was it hard to leave the skinhead movement? I’m much happier now being fair. I’m still a leader. I still hold a position of power. It’s different because now I know how to treat people with more respect and make them partners of what you’re doing, instead of just telling them what to do. I work with great people now–”talented and smart people now. I’m not dealing with a bunch of drunken teenagers who have issues with a broken home. I know how to treat people with respect and that is so much more fulfilling than just dishing out power. I learned how to respect people. Having seen the bad, it allows me to see the good. I’ve been on that side of the fence, and I never want to go back. I’m happy I’m on this side. How do you reconcile your past with who you are now? I can’t–”what I did was wrong. I’ll never be able to justify what I did or reconcile. To even apologize for it or say, –˜I’m better now’–”that’s diminishing what I did. I think that if we don’t learn from our past, we’re making a terrible, terrible mistake. Some people say, –˜Oh that’s who I was; I’m not that anymore.’ But I know that who I am now is because of who I was. I have to remind myself of that everyday. Even on my keys I carry something from the Holocaust museum in Washington, D.C., so that every time I pick up my keys, it’s, –˜Equality, Justice and Diversity.’ I remind myself every day of that–”it’s like an alcoholic. I don’t think I’d ever have that drink again and go back to what I was, but at the same time, I want to remind myself everyday of the mistakes that I made.